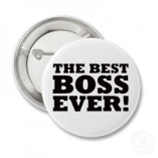 I am assuming you are a "boss" of someone... but I believe you all are Leaders, not Bosses! But I don't think they have a Leader's Day. Leadership is one of the key areas for CASE. We are always trying to provide inspiration to you as you lead. One of the things I often include in my leadership keynotes is the idea we should all read at least one leadership book — not an education book — every quarter! Do you have a favorite one? We would love to see your favorite leadership book listed on our Facebook page! Let's see how many we can come up with this next week! If you are a CASE member, you should have gotten an email last week about several action items! I try not to send out too many emails as I know you get a million every week. This one had 4 really important items. The first was us asking you to take a really quick survey about our website. Hopefully you remember me writing about our new CASE Technology and Communication Committee. They are being led by Carrie Turner (MO) and one of their first actions is this survey to get your input about our website with the intention of making it better. Please take a minute to take this quick survey between now and this Friday, October 19. A Couple of other actions from that email... The 2018 U.S. Congressional Midterms are approaching. As special educators, it is our job to promote civic responsibility with the needs of children and youth with exceptionalities in mind. It is equally important to be aware of the education positions of each candidate so that you vote knowing how your decision will impact you as a professional and children and youth with exceptionalities. CEC's goal is to ensure that you have the information you need to become an educated voter and active participant in our society. That's why CEC is providing you with our nonpartisan voter education guide: I Educate, I Participate: 2018 Midterm U.S. Congressional Election Voter Education Guide. Its purpose is to provide you with a one-stop shop for information and resources to help guide you during this election season. In this guide you'll find information on candidate positions, upcoming town hall meetings, resources on voter registration, voter deadlines, finding your polling place, CEC's policy priorities and k-12 lesson plans for the classroom. 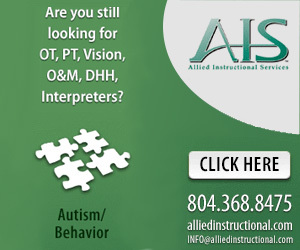 Be sure and download your guide today and use it! And another reminder... Did you know CEC election is going on right now? The election for the CEC Board of Directors opened Monday, Oct. 1 and continues through 3 p.m. ET, Oct. 29. An email was sent to all members with an email address on file, which included a link to a webpage with candidate bios, as well as a link to the online voting site. Members without an email address on file have been sent a paper ballot. Please check out the candidate information and vote! We want to strongly encourage all members to voice their opinion on the future leaders of CEC by voting, thereby helping to create a strong, diverse, strategic board whose performance is effective, creative and demonstrates visionary leadership. Just a few more weeks but you can still get in on this great opportunity! We hope you will be coming to the CASE Fall Conference Nov. 8-10 in Biloxi, Mississippi. We are so excited about the 4 great keynotes and all the amazing breakout sessions. We will have opportunities for you to give your input on national and field related issues and you will have a phenomenal opportunity to network with colleagues from many different states and provinces. What a great opportunity to network and learn! Our PD chair and committee have been working hard to make the 2018 CASE Fall conference one of the best! Now is the perfect time to register for the CASE Fall conference. This is a tentative schedule but it shows what an amazing set of breakout sessions you will have to choose from! So why not register now so you can join us in Biloxi, Mississippi, on Nov. 8-10! Don't forget to also make your room reservation! You can get more information from the CASE website. We had another great turn out last week on our Poll. 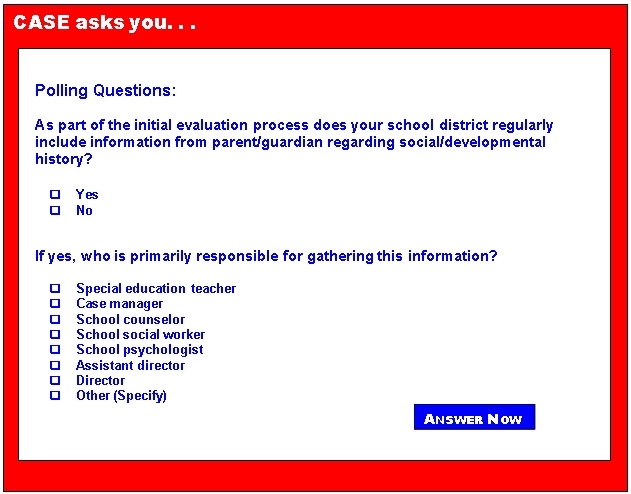 The question for this week was "Regarding IEP programs. Do you...?" First place at 61 percent went to use a pay for private IEP program. Second place was a tie at 17 percent between state developed program free and state developed for pay. Last place with 6 percent was districts who developed their own program. 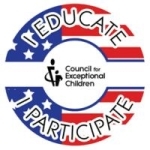 I hope you will be coming to Biloxi because both our Board of Directors and all participants will have an opportunity to provide input to representatives from the Council of Chief State School Officers on a project they are doing on the improvement of IEPs. There will be so many opportunities during the Fall Conference for your voice to be heard with national groups who are looking for input. The conference is going to be amazing! Why not head on over to the CASE website and check out the details, register and get your hotel room today! The poll for this week is a special request from one of the collaboratives we work with. Please take a minute to answer this very important question! I hope you will be good to your boss and those under you will be good to you! Everyone deserves to be encouraged and uplifted as we work to improve the outcomes for all students! We appreciate you and hope you will always find useful resources at CASE to help you help those you work with to meet the needs of students, staff and families! PS ... don't forget to vote in the CEC election! Congratulations, Laurie — CASE is so proud! The Office of Special Education and Rehabilitative Services is excited to announce that Laurie VanderPloeg is joining the team as Director for the Office of Special Education Programs. We have full confidence that Laurie's depth of knowledge and experience as well as her dedication to preparing students for success will move us forward in our commitment to raise expectations and improve outcomes for infants, toddlers, children and youth with disabilities across the country. Part 2 of 2: Language development is essential to educational success, so why isn't it a priority?